Senate Budget Committee Chairman Mike Enzi (R-WY) has released his Chairman's Mark for the FY 2020 budget resolution, covering the next five fiscal years. The budget would reduce deficits by $538 billion over five years, on net, and includes $94 billion of reconciliation instructions. While the budget does not recommend specific discretionary spending levels for the next two years, it proposes a framework for a budget deal that increases spending caps and fully offsets the cost. Unlike the President’s budget, it does not rely on a huge increase in war spending to backfill the defense budget. As a result of the savings in the budget, deficits would peak at $939 billion (3.9 percent of GDP) in 2022 then fall to $748 billion (2.9 percent of GDP) by 2024, about their historic average as a share of the economy. By contrast, deficits under current law are projected to rise to $1.1 trillion (4.3 percent of GDP) by 2024. These deficits would still result in rising debt as a share of GDP. Debt would increase from 78 percent of GDP in 2018 to 83 percent by 2024, which is an improvement on the 86 percent projected in 2024 under current law. 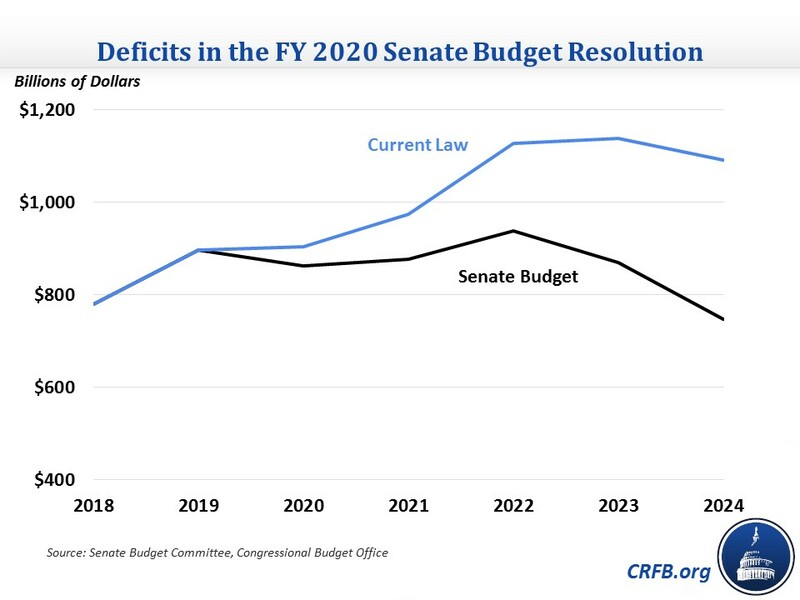 The budget resolution covers five years, the minimum required under law, rather than the ten years covered by recent budget resolutions, and it would reduce deficits by $538 billion – or about 0.5 percent of GDP – over five years. Those savings are the net effect of a $170 billion increase in defense spending and roughly $100 billion in spending for the wars and disaster relief in 2022 through 2024 along with $812 billion of gross deficit reduction. $85 billion of that deficit reduction comes from a three-year freeze in non-defense discretionary spending after 2021. An additional $77 billion would come from Medicare savings; $281 billion from Medicaid, ACA, and other health savings; $72 billion from education programs; and $41 billion from the commerce function. Noteworthy for a GOP budget resolution, the proposal also calls for $176 billion of new revenue, about half of which would come from Highway Trust Fund financing (such as the gas tax) with the remainder from increasing federal employee retirement contributions and other non-tax revenue. Finally, the budget estimates $24 billion of interest savings. The budget does not include a “fiscal dividend” or otherwise count on faster economic growth to achieve its fiscal objectives. Importantly, the budget does not incorporate the potential cost of a two-year budget deal, though it does include a deficit-neutral reserve fund for legislation modifying the discretionary spending caps. It also includes Overseas Contingency Operations (OCO) spending at roughly current levels for the next two years before eliminating that spending entirely and incorporating it into base defense spending. To encourage action on its $727 billion of mandatory savings and revenue, the budget includes reconciliation instructions, which sets up legislation that could be considered on a fast-tracked basis without risk of a filibuster threat, asking five committees to achieve at least $94 billion of savings over five years. The instructions include $50 billion of savings for the Finance Committee; $15 billion for the Homeland Security and Governmental Affairs Committee; $10 billion each for the Banking and Health, Education, Labor, and Pensions (HELP) Committees; and $9 billion for the Agriculture Committee. The Senate budget also includes a few improvements to the budget process. It would eliminate fake savings from changes in mandatory programs (CHIMPs) starting in 2020, establish a point of order against increased OCO spending, and establish a point of order against using different scorekeeping and accounting. These changes would help remove some of the gimmickry in the current budget process. 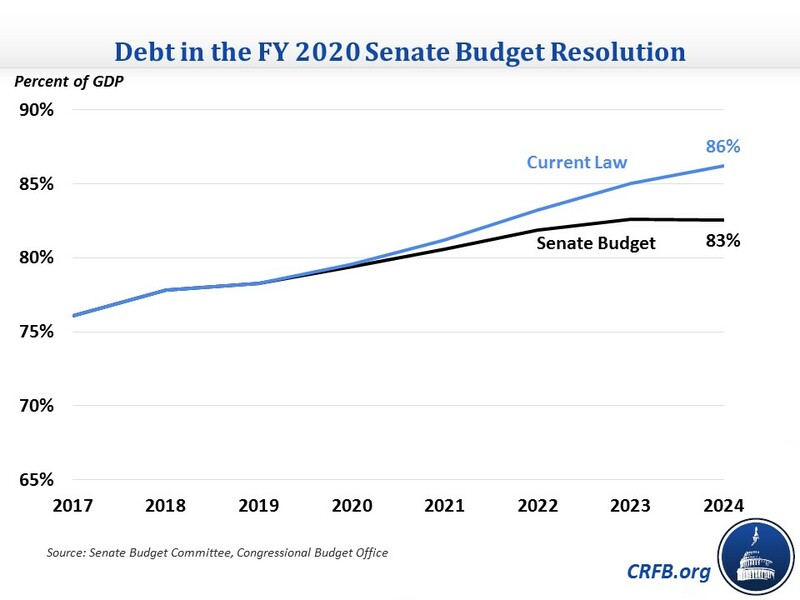 Though it may not put debt on a downward path, the FY 2020 Senate budget adopts a more achievable fiscal goal, bringing a much-needed dose of realism and fiscal responsibility to the budget process. It eschews gimmicks, including the most egregious use of rosy economic assumptions and the OCO account in the President's budget. Hopefully, this budget will be the start of a productive process to deal with the discretionary spending caps and begin to grapple with our unsustainable deficits.